Freshly baked for you by our local Vince & Joe's Gourmet Market! Please order by noon of the day before delivery. 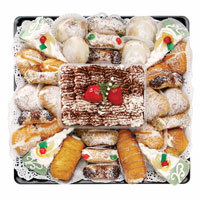 Celebrate with classic Italian dessert favorites! Incredible tiramisu takes center stage, surrounded by cream-filled pastries including sfogliatelle, cannoli, Italian cream puffs, and slices of traditional Sicilian cassata cake. Your edible gift is prepared with care by expert bakers, not factory machines; presentation may vary, but goodness is consistent. Please confirm that your recipient will be available to receive this in person on the delivery date. We will also call ahead to the recipient, and will not leave this perishable gift on the porch or with a neighbor. It must be kept refrigerated until consumed. A platter cannot be brought back to the shop for storage and re-delivery due to food safety concerns.